The third out of ten establishments initiated by the Om Sri Vivekananda Educational Trust, the AVS Engineering College was founded in 2008 with the aim of rendering total quality technical education to the leaders and innovators of tomorrow. Located in the heart of Salem city, the college annually enrolls 540 students to obtain a degree amid a peaceful and serene congenital learning environment. The college campus offers the students with facilities like separate hostels for boys and girls, WIFI, an international standard basketball ground, food court, health club including seminar halls installed in each department. All the existing labs in the campus are fitted with state-of-the-art equipment keeping in mind the importance of practical learning for the students. "We are aware regarding the bent of Indian students upon taking up engineering as a career along with the existing obstacles attached to the entire engineering education system. Hence, we at AVS are always committed to offer students something extra which would eventually accord them a smooth career path," says Senthil Kumar, Correspondent, AVS Engineering College. The college seemingly owns five engineering departments in its premises offering graduation and post-graduation courses, namely - Civil engineering, Computer Science and Engineering, Electronics and Communication Engineering, Electrical and Electronics Engineering and Mechanical Engineering. Affiliated to Anna University, the college follows the curriculum and syllabus set by the University. Apart from this, AVS takes supplementary efforts to adjoin flair in the future engineers and introduces diverse add-on courses, technical and soft skill training during the tenure of the students in the college. Right from the first year, the students of AVS are asked to undertake in-house training in communication and aptitude provided by the college, which is considered as an auxiliary need for engineering graduates now. "The students enter into the college with certain dreams, most of them with a palpable hope of earning a decent job, which inspire us to put job-oriented training in our priority list," opines Raja Vinaygam, Secretary, AVS Engineering College. Learners at AVS are not kept confined within the four walls of the premises, instead, the faculty members motivate them to participate in numbers of online tests in apps and technical contents, which incite the students to come up with new knowledge and wisdom. The students are also accountable to complete projects, which are based on industry-oriented problems, enabling them to get an exposure to the industry and challenges they are going to face after completing their respective courses. Recently, research has evolved into an essential element in the Indian education sphere. While engineers are often referred as the creators, various research works have been adopted by the AVS College to boost the analytical thinking capability and impel the innovation instinct of the students. Senthi Kumar shares, "Over the years the college has promoted meaningful R&D activities with the vision and mission to pursue and promote research in modern technologies." The college has till date published more than 100 research papers out of which 50 have found its place in journals. From time to time, the college receives grants from agencies like ISTE, IEE, CSIR, ICMR and so on. The college encourages both students and the staff members to carry out research works in their interest areas. "Our team of 120 faculty members is our asset who directs the right path to our students throughout their journey in the college," claims Raja Vinayagam. The college stimulates not only the students but also the teachers to undergo industry-internship twice a year to stay updated with the latest development. In order to facilitate plain-sailing internship process of the students, the college has proposed tie-ups with Schneider, Siemens, Barola Technologies, Sirshti Innovations, just to name a few. Covering all the ingredients, which prove to be beneficial for the job seekers, the college has comprehended the growing demand of the enthusiastic entrepreneurs and formed Entrepreneur Development Cell that takes care of the needful. The cell gladly greets many well-known entrepreneurs to share their insight acumen on start-up ideas including funding.AVS is notably the institutional member of NEN. "The testament of the cell's success can be witnessed very prominently by our many computer science graduates who have turned into successful entrepreneurs today by establishing their own company," shares Raja Vinayagam. Today, AVS College with its relentless endeavors has placed several batches of students in companies like Infoview, Qub Cinema, Datalogics, TechMahendra, CTS, Infosys and many more offering a package ranging from Rs. 2.2 lakhs to Rs. 7 lakhs per annum. Sharing the plans of the college, Senthil Kumar concludes, "We are determined to raise the caliber of engineering education in the country by expanding R&D activities, receiving more accreditation from national and international boards and placing our students in companies with maximum salary package in next couple of years." 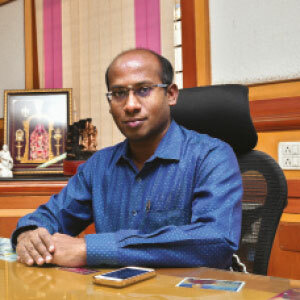 Dr. S. Ragunathan holds a Master of Engineering. He is a PhD holder and has guided six students in their doctorate studies. Having 18 years of extensive experience in academics, he has contributed to more than 50 journals and he has attended more than 100 conferences.